T-minus 3 weeks and counting until hometown hockey legend, Mark Recchi is coming home! Recchi will join other hockey greats such as: Lanny McDonald, Kirk McLean, Darcy Tucker and others in celebrating a four day, hometown hockey festival coming to Kamloops! Scotiabank Hockey Day in Canada will kick off February 3rd up at Sun Peaks Resort. Many other exciting community events will headline hockey festivities throughout family day long weekend. “I can’t wait to come home!” said Recchi. “To me there is no better place to host Scotiabank Hockey Day in Canada.” As a three-time Stanley Cup champion and winner of many National and World championships, Recchi certainly thrived playing hockey, a game he started to play at the tender age of six. “My friends and I would play hockey all the time- Spring, summer and fall there was always a game happening somewhere in Kamloops.” said Recchi. Today Recchi is the Player Development Coach for the Pittsburgh Penguins and thrives on helping young players break into the NHL. Recchi owes a lot of his passion and hockey skill development to amazing coaching and support which Kamloops is known for. “In my mind, Hockey Day in Canada signifies and promotes the passion we have for the game of hockey. It brings out the best in everyone… and sometimes the worst when your team loses. (Laughs) It’s a special day to recognize the sport and I think Kamloops is going to be an awesome host.” Said Recchi. Recchi is excited to be home, to reconnect with friends and family both on and off the ice and be an ambassador for Kamloops hometown hockey. Bring your family and friends down for an exciting and affordable hometown hockey weekend. 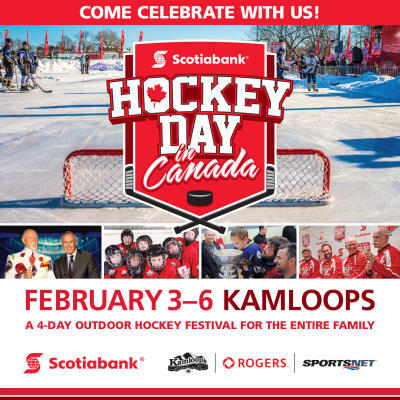 Make sure to check out http://www.tourismkamloops.com/hockeyday for ticket information and updates.